This Orange Fabric Contemporary Living Room Arm Chair with Wood Legs features a slightly flared design that creates an inviting feel along with tapered wooden block feet to support it. Featuring a cappuccino leg finish, this chair will elevate the overall look of your living room. This classy chair will bring serenity to your living place. This chair is both very durable and long lasting. This cappuccino upholstered arm chair is perfect for people who prefer minimal design and subtle elegance. This classy arm chair can bring a touch of warmth with traditional style to your home decor. A rich dark-toned finish and an exquisite craftsmanship accentuate the home interiors and give this chair a dash of sheer elegance. Further adding to its appeal is the fabric and stitched design of the chair that makes a bold statement. Enhance your decor with the charm of this Orange Fabric Contemporary Living Room Arm Chair with Wood Legs that offers functionality along with classic beauty and style. 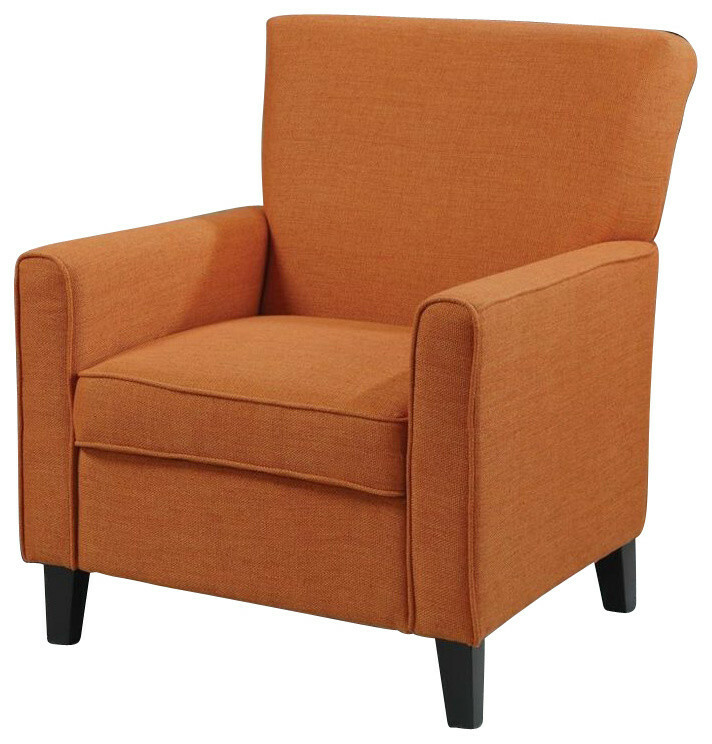 Bring this stylish orange arm chair and modify the look of your living room. The polished look of this marvelous chair will lend a captivating touch to your home decor. Owing to the clean defined edges and square legs, the chair has a smart look. W 31" / H 37"